Bundle up and sip on hot apple cider and pumpkin spice lattes while enjoying the closeness of family and friends. The holiday season is a time for warmth and comforting memories, and orange leaves crackling under boots in the crisp Fall air. Wait, it’s still hot outside. It might not feel like fall yet, but the seasonal festivities are starting anyway. Pumpkin patches, corn mazes, haunted houses and other fall festivities are emerging all over metro Atlanta, and the annual fall festivals that people look forward to all year are coming up. Most of them are family-friendly with adult elements so there’s something for everyone to enjoy. No Headless Horseman on this farm — just 60 acres of family friendly fall entertainment, including hayrides, a corn maze, a sunflower field and pumpkins grown on site. Several locations on the Sleepy Hollow Farm were featured in the Netflix series Stranger Things, including the cabin in the woods and corn maze, which can be toured on select days with purchase of an advance ticket. Fall attractions at the Sleepy Hollow Farm start September 22. Tradition Trees is a locally owned family business with several metro Atlanta locations (Little Five Points, Buckhead, Brookhaven, Chamblee, Decatur, Stone Mountain and Sandy Springs). The farms are primarily known for Christmas trees, but they also have pumpkin patches in the fall. The Still Family Farm has a long history in Georgia agriculture. It is still owned by descendents of the original owner John Willingham Moon. The farm has pumpkins, miniature pumpkins, and other gourds available through September and October. Randy’s Pumpkin patch carries all the same pumpkins and gourds you might expect from a pumpkin patch, but also hosts a carnival-style activity zone for families. Activities include a pumpkin jump, kid-friendly haunted house, petting zoo, face painting, giant slide, trackless train, a mini-maze and pony rides. Randy’s opens on Sept. 28. 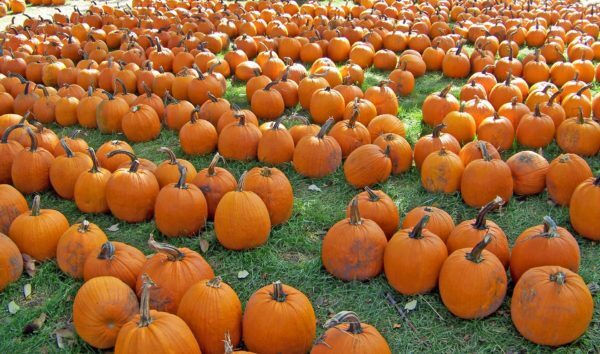 The Yule Forest farm has one of the largest pumpkin patches in Georgia, with home-grown pumpkins cultivated right on the farm. Pumpkins can be purchased pre-cut, or harvested right off the vine. There is also a country store, hayride, and petting zoo on the farm. Season opening is Sept. 29. This is the final year of Uncle Bob’s Pumpkin Patch, which will be closing for good after this season. The 36-acre farm includes a corn maze, petting zoo, nature trails, honeybees, a bat theater, magic and puppet shows, and several decorative gardens. The season starts Sept. 23, and costs $18 for entry. This massive hot air balloon festival at Kennesaw’s Fifth Third Bank Stadium features more than 20 hot air balloons with balloon rides, multiple stages of live music, food, a craft beer garden, and tons of free and family-friendly activities. More than 120 carnival performers roam the park, including fire eaters, aerialists, ice carvers and sword swallowers, and attendees of all ages are encouraged to compete in a Halloween costume contest. Get to Little 5 Points early to secure a spot to watch the parade, because thousands of people come out to one of Atlanta’s most popular Halloween festivals every year. Costumed marchers and decorative floats parade from Washita Avenue and Euclid Avenue to Mansfield Avenue and Moreland Avenue, starting a 4 p.m. Other festivities start at noon, including food trucks and catering, local artist markets, and live music on multiple stages. This annual festival in historic Olmsted Linear Park includes an artist and craftsmen market, local food and drinks, and live acoustic music. The festival is quiet and considerate of the neighborhood, with limited alcohol and noise, but is a great opportunity for a family-friendly day outdoors among historic landscaping and architecture.